I am very excited today to share a little something that is special for me. A few months ago I was approached by Katerina from the online magazine Alovak and asked if they could publish one of my older creations. Of course I said yes! (I was so buzzed about this!) It is so lovely being asked to be published and I am so grateful for Katerina reaching out to me and that is what I am sharing with all of you today! Alovak is a online magazine it is from Minsk, Belarus. It came to life in April 2015 and it is all about crafts and being creative in many different ways and this month they have just published their 9th issue. "We think that creativity should be present in the life of every person, regardless of his kind of activities and education. The aim of the project is to inspire readers to new achievements, to search for oneself and ones' own creative individuality. In the magazine you find interviews with talented people, original author's materials about creativity, master classes and useful advice of professionals, searching for inspiration." 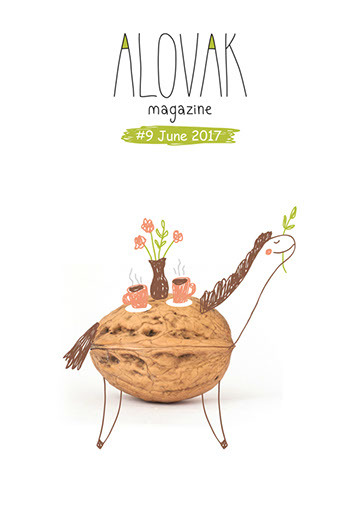 You can read all issues of Alovak magazine for free, just click on the link under the cover photo above and it will take you there. Every issue of Alovak has a certain theme. The theme of the June 2017 issue is about walnuts and what you can do with them. My two little walnut pincushions from my "to put it in a nutshell" posts which I had made some years ago were chosen by the magazine for publishing. I hadn't made a tutorial back then when I actually made the little pincushions but I have now. You will find all the instructions either in the online issue of Alovak or below in this post, that you will need to make a little walnut shell pincushion. Oh, by the way, the word 'alovak' translated means "pencil". I chose to work with walnut shells because they are such a beautiful little creation by Mother Nature. Of course they are also so very cute and just neat to work with too. ... and here is the how-to that I wrote for the magazine. ... cut a circle from your fabric, approx. 3 inches in diameter. Using your needle and thread, sew a running stitch about 1/4 inch away from the edge. (You are making a sort of fabric yo-yo that you need to stuff.) Now stuff your yo-yo with your fiberfill. You need to see how much stuffing will fit into your walnut shell. Once it fits and fills the shell firmly, pull the threads tight and then tie the threads in a knot and cut off the excess thread. Now glue your yo-yo into your shell. 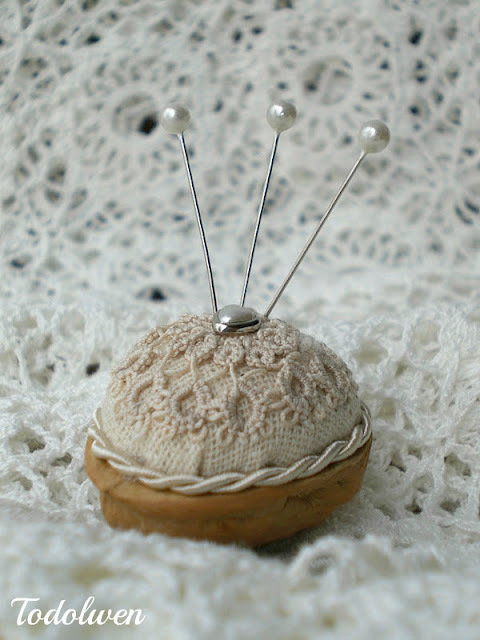 Next decorate your little pincushion to your heart's content with anything you like. Add lace or trim to it, or leave it plain if you wish. I love to add a small piece of old lace and a little piece of sparkle to mine. If you wish to hang your little walnut shell pincushion, make a bow from a length of seam binding and place it aside. If you would like to use crinkled seam binding, I have a tutorial on how to make it on my tutorial page. Now thread another piece of your seam binding through your little metal ring and knot the ends. (The length of seam binding depends on how long you would like it too hang.) Using your craft glue, glue the seam binding with the knot onto the top of the shell and then glue the bow in front of it, covering the knot and make it look pretty. 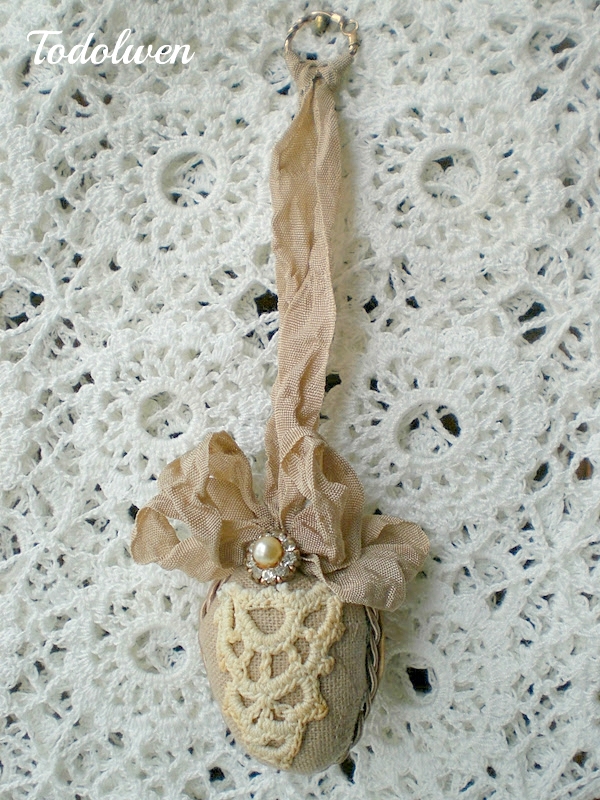 And now you are done and have a lovely little walnut shell pincushion. This is a neat little something to make for yourself, as sweet little gift or you can use it as a Christmas tree decoration even. It is up to you! For anyone new to Todolwen ... I have over 30 free tutorials on my tutorial page and several for sale in my Etsy shop too. Why not pop over to both sites and take a look, you might just find something you would like to try out. Another thing that drew an involuntary 'awwwwwww' from me!!! Wish I had some walnut shells lying about because I want to make one NOW. Wonderful new! Congratulaton on being published. Your little walnut pincushions are sooooo cute! Thanks for sharing!